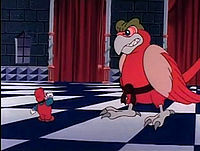 The Royal Parrot is the somewhat moody and elephant-sized pet macaw of Prince Hugo; the Royal Parrot was featured in The Adventures of Super Mario Bros. 3 episode "Sneaky Lying Cheating Giant Ninja Koopas". Strangely, this macaw has three toes on each foot, unlike the usual four on regular macaws and most birds. The Royal Parrot was present during a meeting between Mario, Luigi, Toad, Prince Hugo and Princess Toadstool where its smart-aleck comments angered Mario and caused him to run-off with Luigi, planning on defeating the giant-sized Bully, Cheatsy, Big Mouth and Kooky von Koopa. Unfortunately, Mario and Luigi were preoccupied by the Angry Sun and unable to fight the Koopalings, who managed to reach Prince Hugo's castle. Bursting into the castle, the Koopalings proceeded to capture Princess Toadstool, Toad and Prince Hugo while the Royal Parrot watched. Even when Mario and Luigi, with raccoon powers, appeared, they were no match for the Koopalings, who easily defeated them. Big Mouth Koopa, after defeating Mario and capturing Luigi, proceeded to open the cage of the Royal Parrot and, roughly grabbing the protesting bird, threw it aside and placed Luigi, Princess Toadstool and Toad in the large cage. 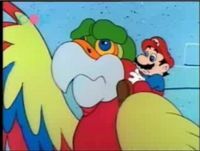 Before he could be grabbed by Bully, Mario, seeing the Royal Parrot, leaped on its back and commanded it to fly away. The bird was at first hesitant to leave its prized cage, but was convinced to leave by Mario, who promised the parrot that he would get its cage back. Later on, the Royal Parrot and Mario had somehow broken into Bowser's Castle and enacted a plan to rescue Bowser's captives and defeat Bowser and his children; oddly, however, the parrot didn't actually do anything in this plan, only watching the battle between Mario, Luigi, Princess Toadstool and Toad and Bowser, Cheatsy, Kooky, Bully and Big Mouth. The Royal Parrot about to attack Mario. After the battle, the parrot came out of hiding and, upon seeing its wrecked cage, which had been destroyed by Mario when he released Luigi, Toad and Princess Toadstool from it, became enraged. Grabbing one of Bowser's magic wands from Princess Toadstool, the parrot made itself bigger and more powerful and began to chase Mario, demanding he should repair its cage; because otherwise, Mario would have to apologize. This page was last edited on February 26, 2018, at 21:36.